Meanwhile, fry the bacon pieces, mushrooms and onion in a large pan with a few sprays of frylight. Add the veg stock and simmer for a few minutes till the liquid is reduced by half. Remove from the heat. Beat together the soft cheese, milk and egg yolk in a mixing bowl. Season with some pepper. Drain the pasta, then return it to the saucepan. Add the bacon and stock mixture and stir. Add the cheese, milky and egg mixture and stir through well to combine everything. Heat gently for 2-3 mins, stirring constantly, until the mixture cooks and thickens. 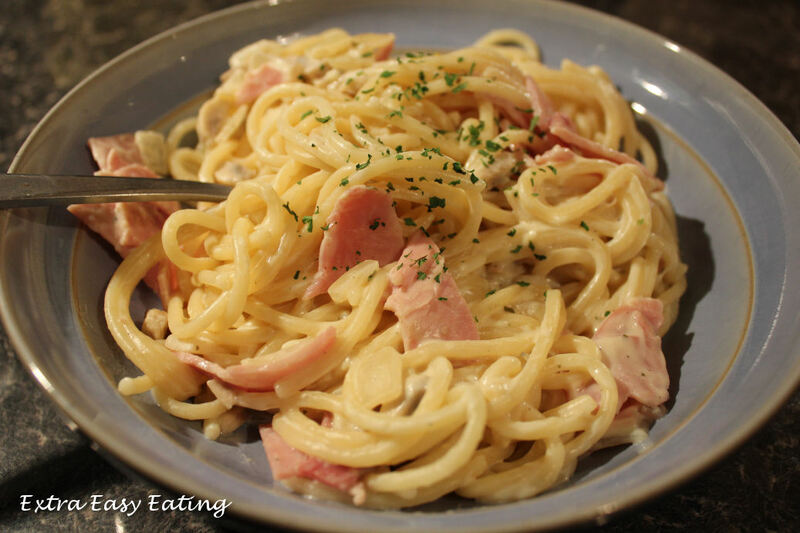 I have made a slimming world carbonara before with a recipe which called for eggs and quark and lets just say by the time I finished I had basically created scrambled eggs with pieces of spaghetti sticking out! So today I tried creating a recipe which was very simple to make with a delicious dish at the end. Well I definitely succeeded, as this was so good. Don't just take my word for it, make it and see, you'd be pushed to tell it was a 'diet' meal. The bacon can be replaced with lean ham or turkey bacon if you rather. I used Tesco extra low fat soft cheese with garlic and herbs however the similar own brand versions are available at other supermarkets, as well as a Philadelphia version. You can omit the milk from the recipe however i find it makes the sauce creamier.